This is a LADIES PLAINS STYLE MINI BREASTPLATE or LADIES BREASTPLATE NECKLACE. 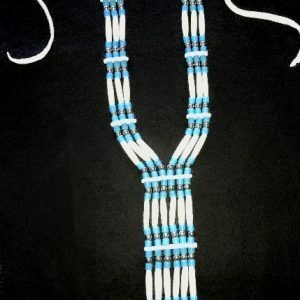 This is a beautiful item that wear nicely with regalia or regular clothing styles. 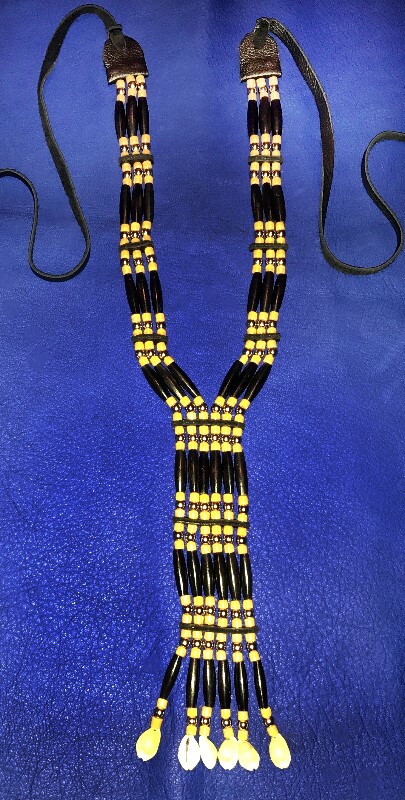 It features genuine black buffalo horn hair pipe beads with brass round metal beads & subdued yellow glass tile beads. Notice the difference of color appearance based on different background colors. 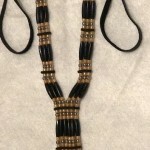 The spacers & ties are hand cut from supple black buckskin for comfortable wearing. 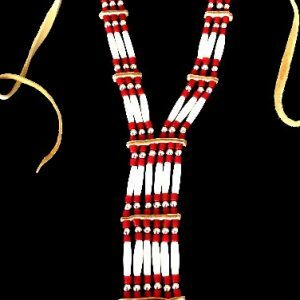 Each strand is finished with polished cowrie shells. The artist, Gary ‘Redwing’ Hunt is not an enrolled tribal member of the Cherokee or Sioux nations, but is descendant of each. Therefore, no legal claim of Native American authenticity may be claimed. But his native spirit is evident in the quality & style of his work.